At the Total Processing & Packaging Exhibition 2013, the Beumer Group will be presenting its filling, packaging and palletizing solutions. One of these is the high performance paletpac layer palletizer, which is now equipped with a double-belt turning device. Beumer’s paletpac high performance layer palletizer for palletizing bags filled with bulk materials can flexibly, accurately and stably stacking paper, PE and PP bags on pallets of all common sizes with quick and easy setting of parameters, says the company. The Beumer paletpac is equipped with a bar, clamp or double-belt turning device depending on the product requirements. These bring the filled bags quickly and gently into the required position. 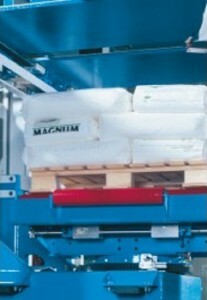 Other exhibits include a Beumer fillpac R bagging machine, which is designed for capacities of 300-6,000 bags per hour. It can now process bags of all kinds and, with a special bag placer, even fill HDPE bags.Beumer says it is also offering the robotpac, a space-saving, fully automatic articulated robot which is able to perform complex palletizing and depalletizing tasks reliably and efficiently. Total Processing & Packaging Exhibition 2013 will be held from June 4-6 in Birmingham, the UK.